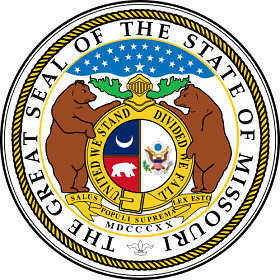 The Missouri state seal identifies government buildings and officials and is a centerpiece for the Missouri state flag. The symbolism of the Missouri State Seal is described below. 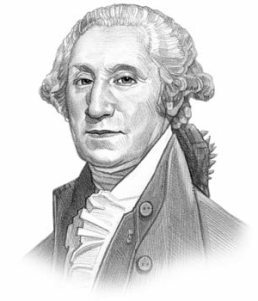 Fact 4: The year 1820 was the year the state was allowed to draft a constitution. Judge Robert William Wells (1795-1864), who designed the Great Seal of Missouri, was a member of the Missouri House of Representatives from 1823 to 1826 and the Attorney General of Missouri from 1826 to 1836. The original State Seal no longer exists as it was destroyed when the Capital burned in Jefferson City in 1837. The first seal had the bears looking towards the viewer and this is shown in the mosaic on the Monroe County Courthouse rotunda floor which was constructed in 1867 and also in old engravings of the design shown opposite. Other modifications were subsequently made to the first design. Wells wrote that "The large star ascending from a cloud into a constellation of 23 smaller stars indicates the rise of Missouri into the ... union of 23 states and the difficulty attending to it ... the Missouri Compromise." The barred front facing helmet above the shield represents state sovereignty. Judge Robert William Wells said that this "indicates that the state, although sovereign as to some matters is not sovereign as to all; the helmet being that of a prince but not that of a king." The origins of heraldry and blazoning arms was due to the need to distinguish participants in combat when their faces were hidden by helmets. In heraldry, a gold barred helmet facing front which was the sole prerogative of royalty. The original design (as displayed in mosaic in the Monroe County Courthouse) showed the helmet with an olive branch on either side, symbolizing peace. The current design shows an indeterminate foliage. The two powerful grizzly bears on either side of the shield symbolize the state's strength and the courage of its citizens. The center of the design is encircled by a belt inscribed with the motto. The Missouri Flyer - Buffalo or Bear? This is an early flyer depicting the design of the Missouri seal. The pictures are interesting as they depict the early inhabitants of the state. On one side are images of Native Americans with a horse pulling a travois. On the other side is an early pioneer in a hunting scene. The somewhat blurred image on the seal section appears to be a buffalo, rather than a bear. We have been unable to confirm that is the case, but this would make sense given the number of bison who once roamed Missouri.